From the foreword . . . . .
"In times of discouragement and distress we need the promises of God which strengthen us and instill hope in our hearts to go ahead in teeth of troubles. . . . May the Lord Jesus Christ Who "is made unto us wisdom and righteousness" bless the readers as they read this small book." Mr. Satyanadham was born at Rajahmundry and had his early education in his home town. He accepted Christ as his personal Saviour in the year 1950. His testimony ‘From Yoga to Christ’ was published in “From Darkness to Light”, edited by Merton Osborn under the auspices of Moody Press at Chicago, U.S.A.
Bro. Satyanadham had his higher education at Andhra Christian College, Guntur and Madras Christian College, Tambaram, Madras. Bro. Satyanadham has been a keen student of the Bible and contributed several articles to learned magazines in English and in Telugu. 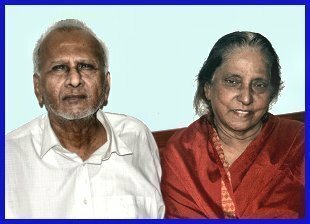 He was for a number of years one of the consulting editors of ‘Evangelical Student’, the literary organ of Union of Evangelical Students of India, Madras. By the efforts of Bro. Satyanadham and his coworkers many Evangelical Churches of Believers came into existence in Khammam and Krishna Districts, epecially in the Koya (tribal) areas of Khammam District. After much study and labour Bro. Satyanadham wrote “GOD’S PROMISES AND PROPHECIES” which is commended for the edification of readers.